Leading Service Provider of no parking board and tin sheet no parking board advertising from Pune. 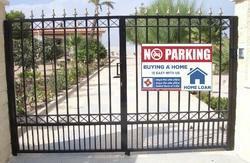 These boards are installed/fixed on the gates of private residential and commercial societies. Boards are available in different sizes – 12x18,18x24,18x18 and the material we use are TIN Sheets and Sunpack. We are manufacturer of TIN Sheet NO Parking Board. If you want a steady inflow of buyers, Business On Wheel's 'NO Parking' Board Advertisements and NO Parking Sign Board Creation is just the right thing for you! With advertising options on the extremely common 'NO Parking' sign boards in residential and commercial complexes, reach out to potential buyers, right at their doorstep! We handle the printing of your advertisements on metal plates of 12 by 18 inches and even provide you with 100% picture proof for the following. With a quick execution period of 10 to 15 days, cost-effectiveness and such high recall value, our service is a definite must-have for all our clients who wish to make a great first impression, right at the gate! Advertisements through sign boards leads to better visibility which leads to better branding which leads to better sales. 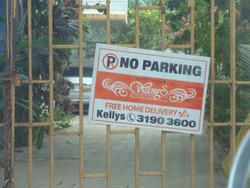 Brand the No Parking Sign Boards with your name and see your business grow manifold. Looking for No Parking Board ?